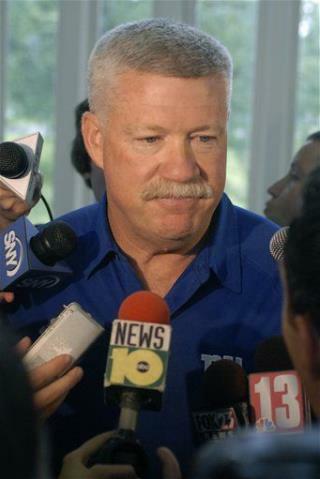 In mourning: Sam Borden of the New York Times pulls off a straight-faced obituary of the mustache belonging to New York Giants offensive coach Kevin Gilbride. ("It was believed to be about 41.") It seems Gilbride messed up shaving and felt "there was no option but euthanize" it. Why the fuss? The four-decade 'stache had apparently become a kind of team institution. Read the full story here. In celebration: Time provides an accidental antidote to the Gilbride obituary with a profile of a Pakistani man's epic—and symbolic—handlebar mustache. Malik Ameer Muhammad Afridi had to leave his hometown of Bara after extremists forcibly shaved him. He grew it back and moved to Peshawar, where his mustache has become a symbol of independence. Read it in full here. If you don't like the stache, you can get out of my country.